A D.C. man was sentenced Friday to 25 months in prison in an animal cruelty case involving 10 different dogs. Charles Palmer, 35, will also serve three years of probation after his release and is ordered not to own any animals. Palmer was reported to the Washington Humane Society (WHS) in April 2012, when a caller said that Palmer was fighting his pit bull-type dog, Porter. He was seen beating him, slamming him to the ground repeatedly, and then bringing him into the woods and leaving without him, said the WHS. When Porter was found, he had two broken femurs, a displaced jaw and was missing several teeth, "following a history of significant physical abuse," said the WHS. During a 20-month investigation that followed, WHS officers visited Palmer's home several times after several public reports of animal abuse. Another dog, Roxy, was rescued by WHS officers from Palmer's home last June after she was found to have difficulty standing. She was rushed to an emergency vet, where she was found to have a broken front leg, broken rear femoral head, broken rear toe, and two lacerations on her head, said the WHS. Both Roxy (inset) and Porter have been treated and adopted by new families. Three other dogs are now deceased, allegedly at Palmer's hands, said the WHS. 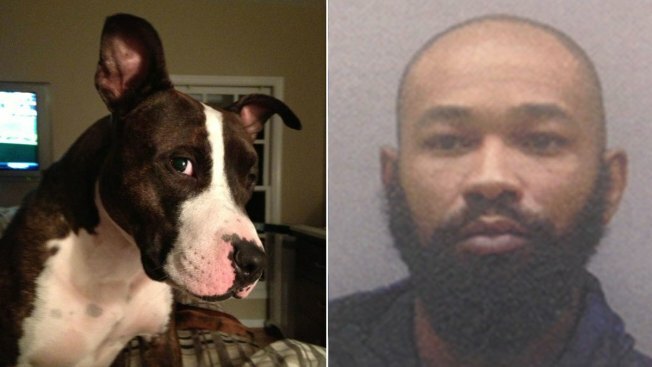 The other five dogs in the case have not been accounted for, according to prosecutors. Palmer was indicted last November on 14 counts, including five felony counts of cruelty to animals and five misdemeanor counts of cruelty to animals. He pleaded guilty in January to two felony counts and one misdemeanor count of cruelty to animals, and a misdemeanor count of simple assault. He had faced jail time of up to five years for each felony offense and up to 180 days for each misdemeanor, in addition to fines. "The officers who rescued Porter and Roxy, the medical team and caregivers who mended them, and the families who fostered and ultimately adopted them, all played a role in today's outcome," said WHS President and CEO Lisa LaFontaine in a statement Friday. "This sentencing sets a precedent that animal cruelty is not acceptable, can and will be charged as a felony offense in D.C., and will be punishable to the fullest extent under the law."